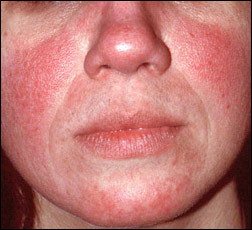 Rosacea is a common chronic skin condition that presents as a facial redness and pimples. It usually affects individuals between the ages of 30-60 years and is more common in fair skin types. Women are affected more frequently than men, but men often have more severe disease. We do not know the exact cause of rosacea but it seems to develop due to a complex interplay between genetic, environmental, inflammatory and vascular factors. Trigger factors in a susceptible individual result in dilatation of blood vessels in the skin of the face. Common described trigger factors include alcohol, exercise, and change in temperature, hot drinks, spicy foods, stress, and ultraviolet light. What are the visible features of Rosacea? There may be ocular (eye) involvement. A skin biopsy may be required to diagnose rosacea. This shows chronic inflammation and vascular changes on histology. Rosacea cannot be cured but there are effective long-term measures that can get the condition under control. Wear a sunscreen SPF 50 throughout the year. UV light is a major trigger for most rosacea clients and this should be incorporated as part of your daily skincare routine. Protection is needed against both UVA and UVB light. Often mineral sunscreens are better than chemical sunscreens as they cause less skin sensitivity. Look for products containing titanium dioxide or zinc oxide. Use skincare products designed for sensitive skin and avoid products containing alcohol, witch hazel, fragrance, menthol and harsh exfoliating agents. Mineral-based cosmetic products are often preferred as they will cause less skin sensitivity. Avoid known triggers, e.g. alcohol or certain foods; and engage in activities that may reduce stress (e.g. exercise, meditation) if this is known to trigger flare-ups. Avoid using a topical steroid to rosacea. Although short-term it will cause an improvement due to anti-inflammatory effects, over time it is likely to cause worsening of the condition. Successful control of rosacea relies firstly on understanding what aspects of the disease need treatment. Someone that has predominantly papules and redness is likely to need different treatment than another who is mainly troubled by prominent blood vessels and flushing. Careful history and examination by your doctor are vital to pick out the correct treatment plan. This is not a case of “one-size fits all”. Often oral antibiotics are combined with topical therapies to treat papulopustular rosacea. These are usually prescribed for 6-12 weeks in the first instance. Tetracyclines helps by reducing inflammation. A dermatologist will advise as to what suits best as treatment needs to be adjusted to suit the skin. LED light has proven effective for reducing redness associated with Rosacea. Prominent blood vessels and background redness respond well to light and laser therapies and can be life changing for clients.IPL and vascular lasers provide good results. This affects men more often than women. The best treatment is either by reshaping the nose surgically or resurfacing via laser therapy with a carbon dioxide laser. This needs to be done by a skilled dermatologist or plastic surgeon. If you have tried topical therapy combined with an oral antibiotic for 6-12 weeks with no benefit, then consider going to a dermatologist .